Very little is known about origins of the Temple of Solomon or the Poor Knights of Christ, as the Knights Templar are also known. The information that made it down through the ages is minimal and often contradictory. The best evidence comes from a later source named Guillaume de Tyre, who claims that a member of the lower nobility from Champagne named Hughes de Payen presented himself before Baudoin II of Jerusalem in 1118 to request approval for the order of the Knights of the Temple. 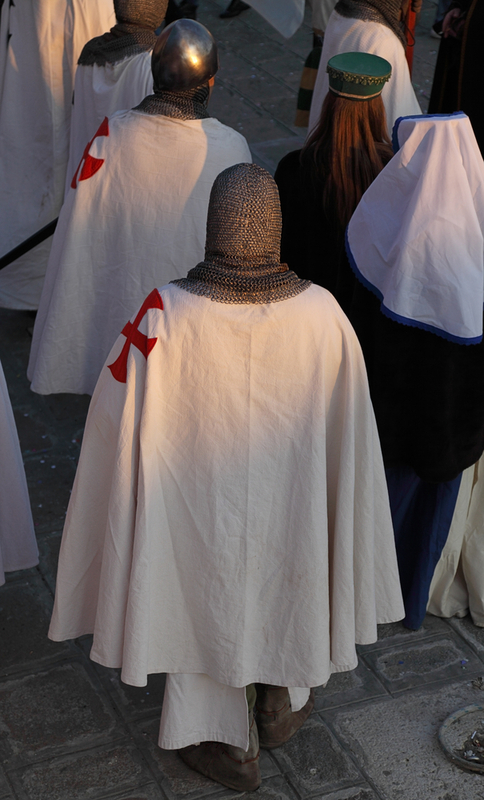 After that year, very little is known about the Knights Templar and their activities in Jerusalem. Is it true that they were keeping the roads clear for Christian pilgrims and, if so, how were they managing this feat with only twelve or so knights in the area? Or was their purpose more sacred and secretive? It is thought that at some point preceding 1128, Hughes de Payen wrote a letter to Bernard of Clairvaux (later St. Bernard) who not only had a lot of pull in his own Cistercian Order, but had plenty of influence in the Catholic Church as a whole. Hughes de Payen prevailed upon him to take the Knights Templar under his very influential wing, and asked his help in gaining official recognition from the pontiff. It is believed that Hughes and Bernard were kinsman, and that Bernard may have even had a hand in the formation of the Knights Templar, so that may explain his eagerness to help. To prepare everyone for the concept of a monastic order whose sole purpose was to do battle and kill – the antithesis of what monastic life was about – Bernard wrote a long open letter called “In Praise of the New Knighthood” which justified the existence, as well as the actions, of the Knights Templar. It is a credit to Bernard’s standing with his fellow clerics that not only did he manage to bring his fellow monks around to his way of thinking, but the Pope as well. In the year 1128, the Pope set a up a council in Troyes, Champagne’s capital. The council’s purpose was to settles disputes between local bishops and other matters, but Bernard quickly brought the proceedings around to his agenda. You may marvel at Bernard’s audacity, but the council was in Champagne, and the area’s rulers were all his close kin. Bernard was treating the Pope’s acquiescence as a done deal, and had been busying himself converting the Rule of St. Benedict to a form that was suitable for the Knights Templar. The Pope knew there was no diplomatic way to refuse. He could not risk insulting Champagne’s rulers. In addition, the advantages of having his own private army in such turbulent times could not be overlooked. Thus, on this day in history, 1129, the Knights Templar won papal recognition at Council of Troyes. This was a turning point for the Knights Templar, with the order’s numbers and influence growing rapidly after this event.